MORDEN, England - Aug. 15, 2016 - PRLog -- As per our previous press release (http://prlog.org/12578702) about the launch of a collection of poem, Whale, by Yogesh Patel along with Mona Dash's A Certain Way for the crowdfunding at Kickstarter, we announce the update about support we are gathering, encouraging others to pledge and support too. 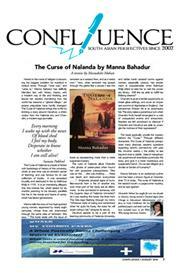 Confluence, a prestigious magazine, has advertised the project for free prominently in its latest August issue. With good space allocated to it, the magazine has also published two whale poems by Yogesh Patel. Albeit project at Kickstarter wants to see a wider involvement and support, but it looks the apathy may have a final say. We also currently have an enquiry from a reporter from the New York Times. Ultimately, however, the pledges must materialise. Visit and see the project for yourself. Make a pledge if you think the whale's song should be heard. If you have any question, please ask us t the project.